There is no other Lady Gaga tribute as accurate, as breathtaking and as talked about as this multi-award winning Lady Gaga tribute. Even Lady Gaga's Management company 'Ate My Heart' couldn't tell the difference between some of her photos and the real Lady Gaga. With 100% outstanding sound alike vocals every time this show is the Lady Gaga tribute that raises the benchmark for all other tribute acts. The show is a visually stunning and dramatic theatrical performance that recreates all of the drama, glitz and glamour of Lady Gaga's most memorable performances. 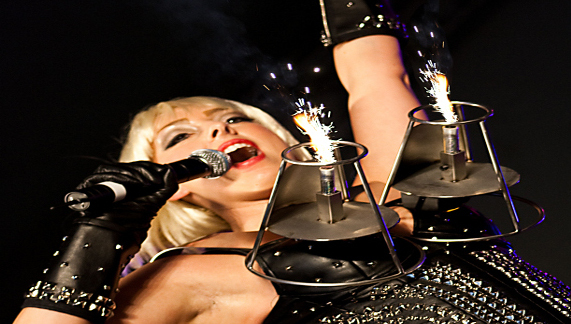 This acts is internationally acclaimed as the "Best Lady Gaga Tribute on the planet"! She recently beat off stiff competition from fellow nominees Sinitta, Gareth Gates, Joe McElderry and Sophie Ellis Bextor to win a prestigious GOSCAR award for the Best Act of 2010. And 2011 saw her set for more success with her sell out Lady Gaga tribute act show at St David's Hall Cardiff on the 2nd of June. This is the only Lady Gaga Impersonator and Tribute in the world that uses an authentic working replica of the Lady Gaga Spark (Pyro) Bra. All the costumes are professionally tailored handmade replicas of the Haus of Gaga wardrobe, designed and created by her and James MacIver (BBC Television and West end Theatre costume designer). The costumes cost thousands of pounds to make, but the attention to detail is noticeable with every single stitch, helping to re-create the experience of drama, attitude and fashion that is "LADY GAGA". NEW! There is a Gaga theatre show also available to book with full gaga Stage set, props, Video backdrops, up to 10 dancers and so much more. From May 2012 you will be able to book The Ultimate Gaga concert Experience. This is the closest thing to a real Gaga Concert... It will include a full live band with some of the most talented European musicians, 100% Outstanding live sound alike vocals, Video backdrops/interludes 16+ jaw dropping costumes, up to 10 professional dancers with replica Gaga choreography, pyrotechnics, Stage set ....the whole package and more.